In the Favorites tab, it would be nice if the Aisles could be condensed like the Pick list tab. Do you think that this is a feasible update? Tracy, thanks for your feedback. We have plans on making aisles under Favorites tabs collapsable like under Pick list tab. However, there is no specific timeline for this feature yet. Please let me know if you have any further questions or comments. favorites, not on my Ralph’s list. It took me a while to figure out the favorites and highlighted where the confusion crept in and an important distinction that needs to be made. My idea of what favorites was that they are items that are specific to a particular store. While being true it is also a little bit confusing. There should be a distinction between favorites (per se) and store specific items. To explain further, if I can only get “Item 1″ at “Store A” then it shouldn’t be available in the search when I make up a shopping list for Store B. If I am making up a shopping list for Store A, then only, should I be able to see Item 1. From the item edit screen, one should be able to click on the “Any List” button to bring up a dialog box where one can can select check boxes listing the Stores that the item will be found in. * “Multiple Stores” = When more than one store, but not all stores have the item. Ps. What I can’t figure out with regard to favorites is what purpose it serves in the item edit screen? Nico, thanks for your feedback and for the details. I assume that you figured out how you can use list-specific favorites. I agree with your suggestion of assigning item to multiple stores so that it would be accessible in search under selected stores only. This is planned for one of the future updates. Hi. I love your program. I am using it for some days and there is one thing i would be able to do with it but can´t see how, can you give me some advice, please? Should i use store specific favorites? How do i do it? My buying routine: I go to my pantry and check what i need, select it on my smartphone (should i use pick list which is huge, or favorits?) after this procedure i would like to see that MG separates the items in various store lists with those items choosen before. Then i go shopping to the specific store list that MG gave me. I hope you understand my problem. Can´t see the best use with this routine, do i use the favorites, maybe the master list? Sorry for my english and thanks in advance. Hi Paulo, thank you so much for your feedback. Kindly note that you need to select destination shopping list manually either you are browsing Pick list or Favorites. You may want to consider using List-specific favorites which allow creating a short list of items which you shop for at specific stores. Hopefully, the planned Pantry feature will help you with your shopping routine when it becomes available. I only downloaded the Lite version recently and am still learning how it works. I have several things in the Favorites List that I don’t remember putting there that certainly shouldn’t be on the list, such as trash bags which I buy from Costco maybe once a year. How can I remove them from the favorites list? Hi Audra, thanks for your question. Kindly note that 5 random items are added automatically to Favorites upon install just to show features of the app. You can delete any item by long-tapping it and choosing Delete. Please see the User’s Guide for a few useful tips. Is there a way to search for an item in the favorites list? i then have to delete. Is there a faster way to find things? Hi Jess, thanks for your question. We may consider adding quick in-list search eventually. In the meantime you may want to try the Search feature which is available under More –> Search. Thanks for a great program. I’ve been getting to know it and have a suggestion for the favorites section. Could it have the option of collapsing and expanding the favorites list by aisle? This would be the same as is possible on the pick list. For example, I have developed a long favorites list for a particular store, and now I find that due to the scrolling required using the favorites list is starting to become inconvenient. The approach used with the pick lists works nicely to solve this. thanks! Hi Geoff, thanks for your feedback and suggestion! We may consider making aisle sections collapsable in Favorites just like in Pick list in the future. Thanks for supporting this. I’d like to second Geoff’s suggestion. In fact, I came to this site specifically to make this recommendation, so was pleased to see that I’m not the only one who would like to see this functionality. Like Geoff, I have a huge Favourites list, so it’s a bit unwieldy without being able to collapse the aisles. I am attempting to follow your instructions as stated on this page but not having success: “To populate Favorites from Pick list or History just select Favorites as destination list on top of Pick list or History and tap items you would like to get added” I am using the pick list and selecting items to add them to a list-specific favorites list. I don’t see anything being added to the favorites list however. Could you please provide guidance? This is a very important function for me as I have imported a long list of items into the pick list and want to preserve it within the favorites. Hi Geoff, thanks for your question. If you want to add items to your list-specific favorites list, please make sure that you have Your list name with a star selected on top of the Pick tab. 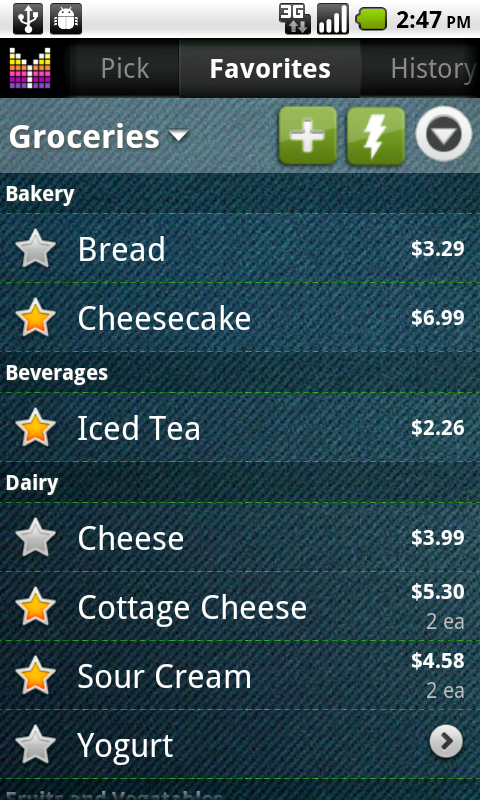 A star symbol next to the shopping list name indicates list-specific favorites of the given shopping list. 1) can’t assign favorites to my pre defined asile list for this “store” (list). In the list proper the custom asiles display but not in favorites – is this a bug? 2) Where can I store the price per 100g – I can see how to store the price of the whole item but this is not useful for comparison – I guess the best place would be the comments? Would like to know your thoughts and if I have missed something. Hi Tania, thanks for contacting us. 1) Yes, unfortunately there is a bug in the app which does not allow changing aisle for items in list-specific favorites list. 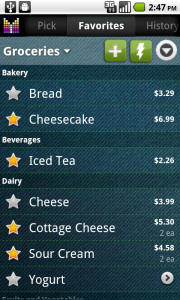 The workaround is to add items to your shopping list and change aisles there. Items in list-specific favorites list should update automatically. 2) This sounds like planned Compare store prices feature. It will be possible to enter base unit and price to compare item cost between stores. When I select items to shop for they go into my ‘cart’ okay. However, as I check them off at the store they do not seem to go back to my master list for the store, but rather to history! Then I’ve had to reconstruct my master list. Am I doing something wrong? Kindly note that behavior you describe is perfectly normal in Mighty Grocery. You need to add items to your shopping list before you go shopping. I’d recommend using Favorites feature so that you could easily choose from the items that you buy often. Or you may want to add items from History.